FLORAbrella & ColorCam WIN Adafruit + @element14 Challenge! 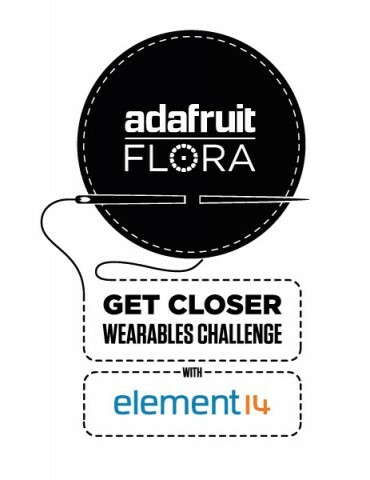 Thanks to all the competitors in the Adafruit + element14 FLORA "Get Closer" Challenge! It was an absolute pleasure to watch the journeys of eight wearables projects in the e14 Arduino community. We had to name a winner, but we couldn't decide on just one. The TWO winning projects are Leslie Birch's FLORAbrella and Linda Kaspers' ColorCam! Each will receive a wearable electronics project handmade by me, and element14 has provided an Arduino Robot, which has been randomly selected to be awarded to Linda. Wow, it has been quite a project. From my beginning research of unique umbrellas, to wiring individually addressable LED Neopixel strips and facing 3D printing – I’ve just learned so much. Adafruit’s Forum has been outstanding, along with the support I’ve received from the Element 14 folks. Anyway, I was going to shoot my video last night, but yesterday my dog had to have a sudden operation to remove a cancerous tumor. Don’t worry, it went well, but after seeing him so fragile and woozy, there was no way to leave him in the house alone. So, I had to shoot tonight with the help of my husband and a friend (love you, Annarita Gentile!). It was all done with an Iphone, how funny is that?? So, without further ado, this one is for you. Hugs, kisses and open hardware to tout le monde! (hint, hint). This is it! My final post! This is were you get to see my ColorCam and this nifty video I made. First of all I would like to take the opportunity to thank Element14 and Adafruit for selecting me for this challenge. It was one bumpy, but instructive ride! Also a big warm thanks for my boyfriend Victor Sluiter, who has helped me so much along the way. I can honestly say I wouldn't have been able to do this without him! So, thanks honey! So here is my video, I hope you all like it! Please, let me know what you think or if you have any questions. Ps: I attached my source code at the bottom. It's full of dutch comments, but I'm happy to translate them for you! Every Wednesday is Wearable Wednesday at Adafruit! We're bringing you the blinkiest, most fashionable, innovative, and useful wearables from around the web and in our own original projects featuring our wearable Arduino-compatible platform, FLORA. Be sure to post up your wearables projects in the forums or send us a link and you might be featured on Wearable Wednesday! Flora ColorCam: It was a night of revelations. This Year on element14: 10 Highlights From Another Amazing Year on the Community.